The Town of Amherst, in partnership with Modern Disposal is instituting new recycling guidelines. These are in response to the recycling crisis affecting the entire nation after China and other Asian countries began limiting the amount of recyclable materials being imported into their countries. The Town developed the acronym “CLEAN” to help educate residents on the forthcoming changes. The Town of Amherst and its residents recycle more than 20,000 tons of material per year which includes curbside recycling, yard compost, and metal goods. Normal weekly refuse and recyclable collection will occur with the holiday exceptions below. If your collection falls on or follows any of these days, your pick up will be delayed one day with Friday's pick up done on Saturday. Yardwaste collection begins on April 1st and runs through November 30th annually. 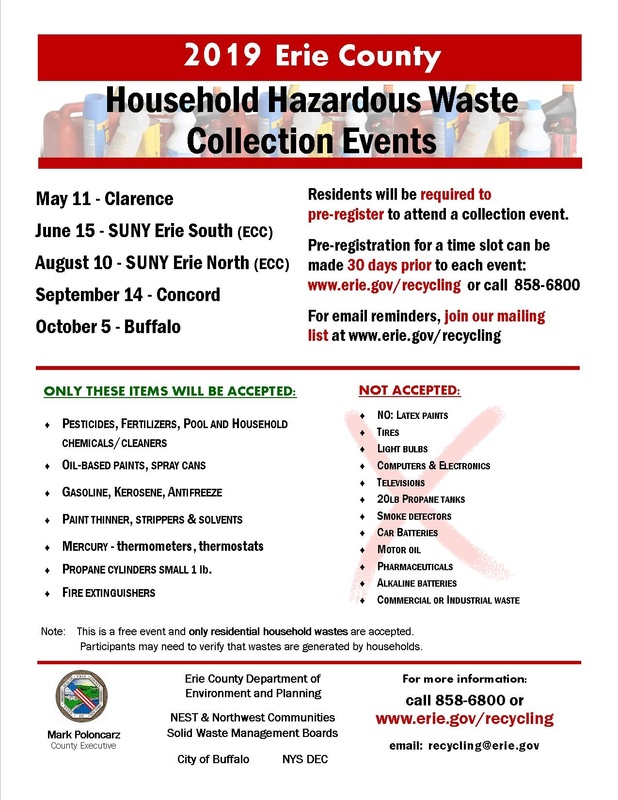 Please call the Refuse Control Office at (716) 631-7119 or email refuse@amherst.ny.us to order a replacement tote or recycling tote (if broken).